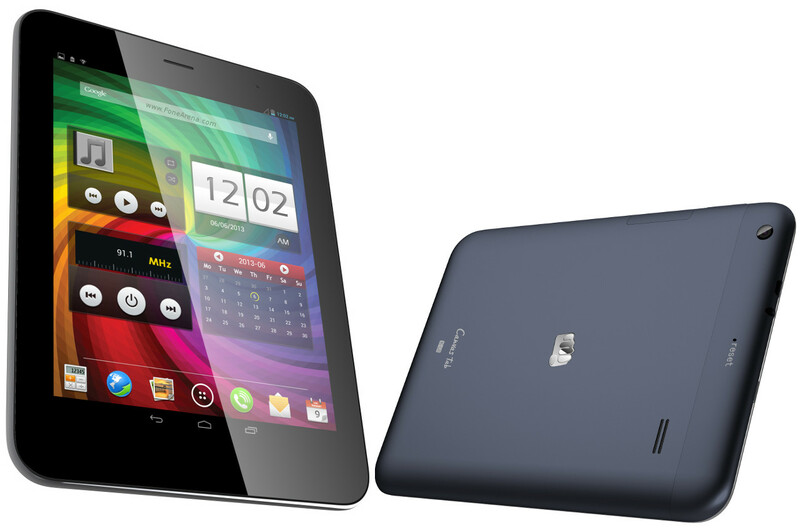 Micromax Mobile announced its first flagship tablet in the Canvas series. The Micromax Canvas Tab P650 has 1.2 GHz Quad-Core processor, 8-inch IPS display, 1 GB RAM, 16 GB Internal Memory, 5 MP Auto Focus Rear camera and 2 MP front camera. The Canvas Tab runs on Android 4.2.1 and is upgradable via FOTA. The tab is light and sleek design with full aluminum body. The device is powered by 4800 mAh Battery. The Canvas Tab features 3G with Calling facility, 1 GB RAM, 16 Internal Memory MicroSD card support up to 32 GB, look away to pause the video (same feature you found in Galaxy series), Video pinning, pop-up browser and Gravity sensors. In connectivity you’ll find GPS, Wi-Fi and Bluetooth 3.0. The Tablet pre-loaded with apps like Spuul for watching free movies online, Music Hub, Opera Mini and M Live. The company also offers a unique M! Security features that offer security solutions including Back-Up, Anti-Theft Tracker, antivirus. The Micromax Canvas Tab P650 is priced at ₹ 16,500 and will be available in 2 colors White and Blue and would be available across all leading retail outlets in India from 18 September, 2013.